UMN SDS: Solidarity with the Workers of Wisconsin! 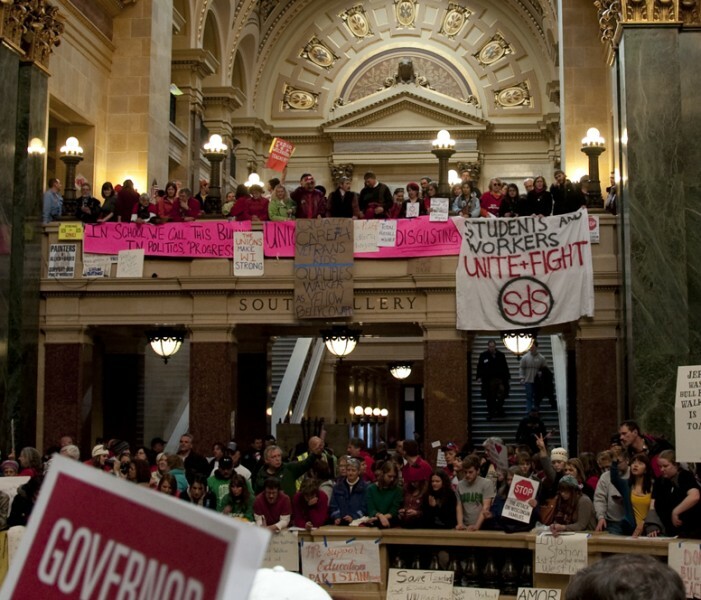 University of Minnesota – Twin Cities Students for a Democratic Society (UMN SDS) sends our solidarity to the tens of thousands of workers throughout Wisconsin demanding an end to Governor Walker’s union-busting bill. Wisconsin’s struggle sheds a light on what is to come next for working people throughout the country if we do not stand up now to unite together and fight this bill. Everyday, thousands of people are being laid off and being forced to face the brunt of failing “benefits” systems like Unemployment Insurance or having their pensions slashed. Now, Governor Walker wants to annihilate collective bargaining rights for public-sector workers. Unions are one of the only ways that workers still maintain control over the decisions that affect their livelihoods. This anti-worker legislation must be stopped! For too long, those in power have been balancing the budgets on the backs of poor and working people; now, to say that workers won’t even have a seat at the table in deciding the future of their work is an outrage! At the University of Minnesota, SDS has struggled side bye side unions workers long and hard to demand an end to involuntary furloughs, lay-offs, tuition increases, and a right to shared governance. As students, we are impacted by these critical decisions since most of us will also soon be workers. Public sector employees make our educations happen through answering our questions about classes to posting our grades. In a flailing economy, workers need to have the right to collective bargaining. We must fight back to ensure that collective bargaining is still available for generations to come. Defend the rights of working people! From National SDS: All Out to Support Unions & Save Our Education! Students for a Democratic Society stands in solidarity with the workers and students of Wisconsin who are taking a stand against Republican Governor Scott Walker’s attack on the right of public workers to bargain collectively. SDS is calling on all students and youth in Wisconsin to protest and walk out, and for solidarity from students all over the country. Like Californian protests last year, Wisconsin is standing up and fighting back! More than 20,000 students and workers are laying siege to the Wisconsin State Capitol in Madison to stop an assault on unions and education by the new Wisconsin Governor Scott Walker. Students for a Democratic Society and others are organizing a system wide walkout at the University of Wisconsin. Students at colleges big and small are leaving classrooms to protest in support of their education and their teachers. 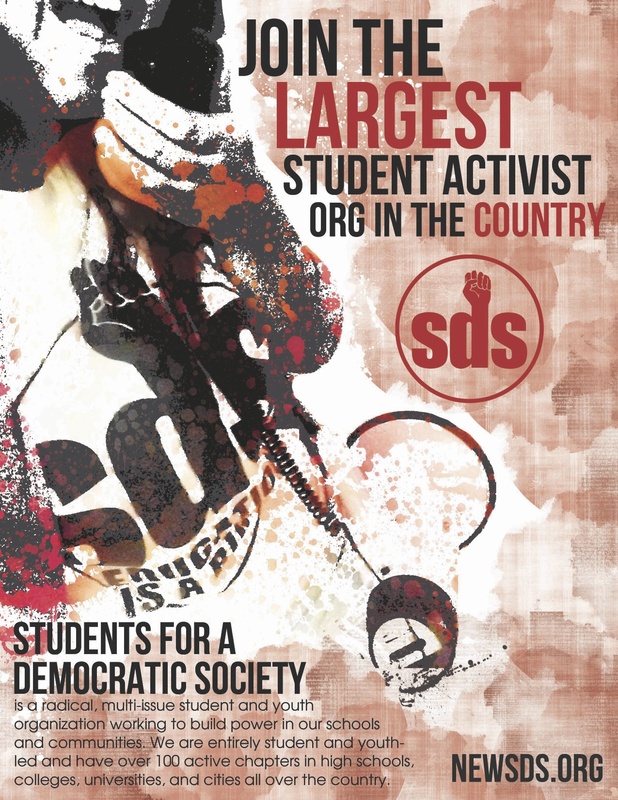 Students for a Democratic Society (SDS) are making announcements in lecture halls, backed up by our union faculty. At least 18 school districts are closed due to teachers calling in sick to go protest in Madison and save their jobs. Like others, high school students are wearing red, the color of solidarity, and pouring into the State Capitol building to occupy it. This is an education we will never forget! For the second day in a row, upwards of 20,000 union members, students, unemployed workers, and families are out to protest this assault on workers’ rights. Teachers, secretaries, social workers, fire fighters, clerks, janitors and maintenance crews are united in protesting Governor Walker and the Republicans. Students make up a good proportion of the Capitol occupation and some local rallies are mainly students. Wisconsin is now center stage in the struggle of working people against attacks on their rights. We in SDS are inspired by the people of Wisconsin in their response to Governor Walker’s anti-worker and anti-teacher attacks. Like the tens of thousands of people in Wisconsin have showed thus far, we too will not stand to see Walker have his way. Collective bargaining is a right that many people have given their lives fighting for. We will not let Governor Walker drag us backwards; we can see how public sector workers in North Carolina and Virginia, who currently have their collective bargaining rights denied by Jim Crow laws, are suffering. Now is the time to ensure Walker’s proposal is defeated. We pledge our continued action and support in this struggle. Workers and students across the nation are watching as Wisconsin leads the way in fighting back against these outrageous attacks on workers. Dare to Struggle! Dare to Win! On March 4th of 2010, faculty, campus workers, and students exploded in protest all throughout the country to demand an end to the ongoing attacks on education. Again on October 7th, 2010 over twenty chapters of Students for a Democratic Society protested on their campuses; from coast to coast chapters held rallies and marches. October 7th was a day to also highlight the 9th year anniversary of the war in Afghanistan as well as the then-recent attacks on anti-war and international solidarity activists by the Federal Bureau of Investigation. This year, Students for a Democratic Society supports the month-long call to action in March and is calling on students nationwide to take action on March 2nd of 2011. We believe that education is a right, not an economic privilege for the advantaged. We demand and fight for a university that is for everyone! We believe big administrators on campus should cut their own pay checks instead off raising our tuition. We say “Chop from the Top!”; cuts should be made to the bloated salaries of those on top. Front-end staff should not have to endure layoffs and furloughs. We also unite with the demands coming out of Arizona where programs like Ethnic Studies are at risk; these programs are NOT expendable. We want student, worker and faculty control over our universities; we should be in control of our own futures and lives. We also have significant concerns that should be paid attention to this year. While education is under attack, while the U.S. government maintains war and occupation in Iraq and Afghanistan, while the Egyptian people opposed and ousted a regime that the U.S. government has propped up for so long, activists here are facing jail time for opposing U.S. foreign policy. Anti-war activists and international solidarity activists, including one woman from SDS, have been subpoenaed before a grand jury for an investigation of “material support to terrorism”. These accusations are meant to scare and intimidate people away from speaking out against the government, and highlight the importance of continuing to organize and protest. We will not see our futures crumble to these scare tactics and we will fight back against them! Finally, we see the actions students are taking all over the world, such as in the United Kingdom and Italy, and we are inspired by their courage and determination. SDS is calling on chapters to organize and take action on March 2nd, 2011. When people come together and demand change, a better world is possible. Strike, rally, walkout, occupy, sit-in, teach-in, leaflet, or table! Whatever you’re doing we want to hear about it! Make March 2nd a day to remember. Education is a right, now is the time to fight! Let us know if you’re taking action and what you’re up to! National SDS: Stop FBI Repression. Kick the FBI Off Campuses Now! On September 24th, the FBI served subpoenas to many well-known anti-war and international solidarity activists at the behest of U.S. Attorney Patrick Fitzgerald. Seven of these activists in Chicago and Minneapolis had their homes raided and property, including their children’s drawings and homework assignments from school, taken from them. This initial attack also targeted Tracy Molm, an SDS organizer in Minneapolis. According to the FBI, these raids are supposed to show evidence of material support for terrorism. In reality, it is an outrageous claim, and a bold-faced attempt to suppress our democratic right to oppose US policies at home and abroad. Since then, 9 more activists have been subpoenaed bringing the total up to 23. Students for a Democratic Society opposes and condemns these raids. We furthermore unite with hundreds of other organizations to demand an end to this witch hunt and an end to the grand jury. We know that the roots of the FBI run deep, which includes maintaining a presence on our college campuses. We want the FBI of our campuses now! The presence of the FBI quells free speech, intimidates students, and creates an atmosphere of state repression in the very places that are supposed to encourage learning and free thinking. Historically, the FBI has consistently extended itself beyond its basic mission to investigate serious interstate criminal activity by illegally and unethically persecuting activist groups that were attempting to change American society for the better. Like the other groups that have been targeted, SDS maintains a political character that is staunchly anti-imperialist, anti-war, and openly opposes the poor policies of the U.S government. We stand with those that have been targeted and anyone who fights for change. The FBI, through their largely unconstitutional actions, create an atmosphere of intimidation and stifle freedom of speech, with the goal of suppressing movements who disagree with the imperialist policies of the United States. Stop the suppression of freedom of speech! Stop the raids on activists! FBI off college campuses now!